Aquilegia (Columbine) is a genus of about 60-70 species of perennial plants that are found in meadows, woodlands, and at higher altitudes throughout the Northern Hemisphere, known for the spurred petals of their flowers. The genus name Aquilegia is derived from the Latin word for eagle (aquila), because the shape of the flower petals are said to resemble an eagle's claw. "Columbine" is derived from the Latin word for pigeon or dove (columba). 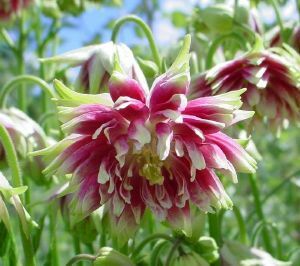 Aquilegia vulgaris 'Nora Barlow' is an erect plant, with divided, dark blue-green leaves and nodding, spurless, double flowers 2-3cm in width, composed of many narrow, dull deep pink and pale green petals. This popular herbaceous perennial will tolerate any half decent soil. Growing in full sun and growing to around 80cm tall, cut back dead stems in autumn and don't be surprised if this plant self seeds. Ideal for informal cottage planting where it can seed and spread at will. Easily grown in average, medium, well-drained soil in full sun to part shade. Tolerates a wide range of soils except heavy, poorly drained ones. Prefers rich, moist soils with light to moderate shade. Remove flowering stems after bloom to encourage additional bloom. Keep soil uniformly moist after bloom to prolong attractive foliage appearance. When foliage depreciates in autumn, plants may be cut to the ground.